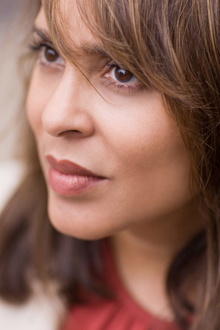 Emory professor Natasha Trethewey explores themes of race and memory in ‘Native Guard,’ her Pulitzer-winning poetry collection being adapted for stage at the Alliance Theatre. Photo by Terry Thomas. Tickets are on sale for the premiere performance of "Native Guard," a new stage adaptation of the Pulitzer Prize winning poetry collection by former U.S. Poet Laureate Natasha Trethewey, director of the Emory Creative Writing Program and Robert W. Woodruff Professor of English and Creative Writing. The adaptation, which for the first time interprets Trethewey's poetry through elements of acting, music and the visual arts, opens the Hertz Stage season at Atlanta's Alliance Theatre and will run Sept. 26 through Oct. 19. The Alliance production of "Native Guard" is part of the National Civil War Project, an initiative among theaters and universities across the country to create new theatrical works commemorating the 150th anniversary of the American Civil War. The stage interpretation of "Native Guard" was developed with support from the Playwriting Center of Theater Emory. Winner of the 2007 Pulitzer Prize for Poetry, "Native Guard" juxtaposes the deeply personal experiences of Trethewey, a child of a then-illegal marriage between her black mother and white father living in 1960s Mississippi, with the experience of a soldier in the Native Guard, the first African-American Union troop in the Civil War, charged with guarding white Confederate captives. "'Native Guard' is nothing less than memory made real, visceral and breathtakingly present," says Susan V. Booth, director of "Native Guard" and the Alliance Theatre's Jennings Hertz Artistic Director. "At its best, theatre leaves us bigger, better and fuller than we were when we stepped across its threshold; Natasha Trethewey's poetry does that in ways that reach straight into the reader's DNA," Booth says. "What we're aiming to do is not bend her poetry to our art form, but to bend our art form to best serve her poetry." In the second act, audience members will be invited to participate in a discussion about the play they have just experienced. Each discussion will be hosted by a different community leader, who will begin by sharing his or her own thoughts on the work before inviting others into open discussion. In addition to Trethewey herself, discussion hosts will include Lois Reitzes, WABE radio host; Camille Love, executive director of the Office of Cultural Affairs for the City of Atlanta; Carlton Mackey, chair of the Emory Ethics and Arts Program; Paul Root Wolpe, director of the Emory Center for Ethics; Justice Leah Ward Sears, former chief justice of the Georgia Supreme Court and Emory alumna, and more. "Native Guard" will feature actors Thomas Neal Antwon Ghant and January LaVoy. Original music will be provided by vocalist Nicole Banks Long and composer Tyrone Jackson. The official opening night and media preview for "Native Guard" will be Wednesday, Oct. 1, although tickets will not be available to the general public for that performance. Performances will run Tuesdays through Sundays. Tickets start at $25 and are available at the Woodruff Arts Center Box Office or by calling 404-733-5000. Tickets are also available online at www.alliancetheatre.org/nativeguard. Discounted rates are available for members of the military, seniors, students and groups of 10 or more.